Political analyst Ivan Tsvetkov discusses Russia’s foreign policy in 2014. Russia’s foreign policy in 2014 was defined by a massive geopolitical experiment undertaken by President Vladimir Putin in response to the uprising in the Maidan in Ukraine. The experiment was a chance for Putin to test his view of international relations and Russia’s place in the world — a vision he had developed during his previous years in power. Previously, Putin’s foreign policy moves did not go beyond routine reaction to external challenges. In 2014, Putin finally decided to compare the view of the world he had formed in his head against objective reality. Perhaps this stage is what leaders of major world powers who have remained at the helm of a country for more than a decade inevitably come to. By this time, they think themselves more experienced and wiser than their foreign colleagues who are restricted by election cycles. They think that in the remaining time that providence has given them they must accomplish something truly great, something to be remembered for. • Russia’s economic weakness will be offset by its increased political influence. The events of 2014 have shown that many of Putin’s theses do not look very convincing when confronted with reality. The ties between Europe and the United States turned out to be far stronger than expected, while the level of support that Russia has gotten from “non-Western” countries at times has looked utterly depressing. 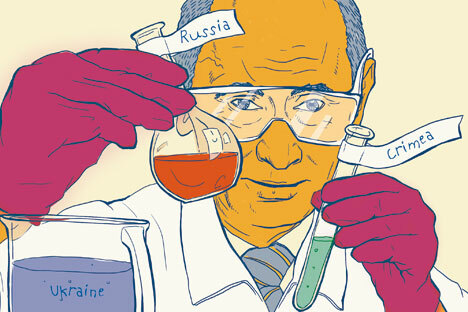 However, unlike ordinary experiments, after which scientists can wash the test tubes and close the lab doors behind them, Russia’s foreign policy experiment cannot easily be stopped. Additionally, Putin does not seem inclined to do so. Judging from his annual address to both houses of the Russian parliament, his belief in his worldview has only become stronger, and the current setbacks are interpreted only as interim outcomes. For example, in his address, Putin said that NATO’s buildup along the Russian borders in 2014 should be viewed not as a reaction to Russian aggression, but as an implementation of long-held plans. Thus, Russia’s actions have only helped to unmask these secret machinations. Therefore, in 2015, Russian diplomacy is expected to continue to pursue aims consistent with this worldview. First off, Russia will likely continue its attempts to build relations with individual European countries in order to break the unity of the Western bloc —particularly regarding the sanctions policy. Secondly, Russia will continue to put forward bold initiatives at meetings of the BRICS, S.C.O., G-20 and other “non-Western” groups. Finally, an increase in the kind of tried-and-true Cold War tricks should be expected. Despite the intransigence demonstrated in Putin’s speech, the difficulties that Russia has faced in 2014 as a result of a consolidated resistance from the West and unexpected indifference from the rest of the world have already introduced at least one adjustment to Russian president’s foreign policy experiment. He appears to have come up with one more hypothesis that he will most likely start testing next year. In his address to the Federal Assembly, Putin made it clear that the events of 2014 remind him of 1941–1942, when the Soviet Union was suffering heavy defeats from Nazi Germany and was within a hair’s breadth of its defeat. In this analogy, this current period of setbacks must be followed by something comparable to the great victory in Stalingrad, the Kursk tank battle or the start of the Soviet Army’s victorious march to the west in 1943. Putin will be looking for such an event to turn the tide in 2015. Ivan Tsvetkov is an associate professor at the School of International Relations of St. Petersburg State University. He is an expert in U.S. history, foreign policy and society.